When I started this friendship storytelling project a year ago I had no idea where it would lead. I just knew that I wanted to talk to other women who had enjoyed a close, loving relationship with a woman friend and find out how their lives had changed as a result of losing her. I knew that after 13 years, I still missed my best friend Madeleine, especially at intense moments of happiness or sorrow in my life when I yearned to share my feelings with her. I wasn’t surprised to discover the joy other women felt from their female friendships. Often the relationship was described in similar ways—their friend was beautiful, they had fun together, they spent hours talking about everything, and no one really got them the way their best friend did. Likewise, the grief they felt after their best friend died was deep. Many went into a slump and were depressed. Some described being in a cloud for a year or more afterwards. And regardless of whether their friend died recently or decades earlier, they still missed her. The other common element was a feeling that our society does not recognize friend grief. While mourning rituals are clear when a parent, spouse or child dies, people may not even know how close two women are. Moreover, your boss probably understands if you take a week off from work to mourn a close family member, but just try taking that time if your best friend died. That type of grief is not recognized by society; it is called disenfranchised grief. This could also refer to the loss of a pet, the loss of a home or a miscarriage, among other types of losses. I spoke to Harriet Vogel, author of “Sad Is Not Bad,” and she said that the grief you feel when you lose a friend is not different from other close losses, except it is not acknowledged by society. People may think, she said, it was “just a friend,” when in reality that friend could be closer to you than a biological connection. Harriet’s memoir is based on “Dear Jerry” letters written to her husband after his death. As a professional grief counselor Harriet knows there are many ways to process grief and had often recommended writing as a therapeutic tool. By writing, Harriet said, you connect and “keep your memories alive.” That’s why, she said to me, you got comfort from writing a letter to Madeleine years after she died. 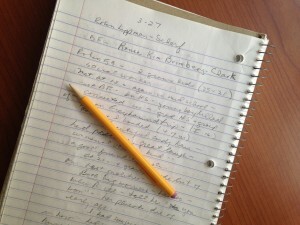 The act of writing to a departed loved one “keeps the relationship going,” she said. I admit that when I started interviewing women for this project I did not anticipate the healing power of storytelling, but after doing 25 interviews I started to hear from several women about how comforting it was for them to share their story. Kathy Spirtes said that talking to me had helped her release her love and grief about Rosemary “to the universe.” It was also comforting for her to know that she wasn’t alone. Robin Lippman-Scharf told me that when she misses her best friend Ronee she comes to the Friendship Dialogues website and rereads their story. Renee Bundi told me that reading the stories from other women at our website gave her the strength to tell her story about Aggie. If you are ready to share your friendship story, we are ready to hear it.